Teeth are tough. Formed from the hardest substances in the body, they’re harder even than bone. But they’re not indestructible. Throughout life teeth are subject to injury—maybe it will be a blow from a hockey puck in your twenties. Or a luckless chomp on an unseen popcorn kernel in your thirties. Or a molar that’s had one too many fillings in your forties. Whatever the scenario, at some point most of us will need repair for a weakened or broken tooth. 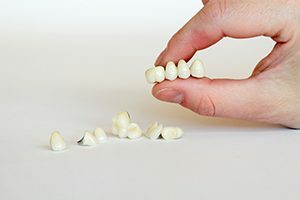 For such situations, crowns and bridges are the workhorses of restorative dental care. Crowns and Bridges: What are They? “Crown and bridge” is a collective phrase for a broad range of treatments. We rely on crown and bridge treatment to replace missing teeth and rebuild damaged ones. The goal is to return a blemished smile both to good function—eating and speaking efficiently—and to good looks. The parts of the mouth are dynamically balanced. So when even a single tooth is lost or broken, the whole machine goes out of kilter. The teeth on either side of a disintegrated or missing tooth begin to drift into the resulting space, or the opposing tooth will grow longer. Such tilting, shifting teeth are prone to gum disease. The bite is compromised. And the integrity of your mouth is gone. When a tooth has sustained extensive damage and is still healthy enough to save, we place a crown. A crown, or “cap,” is a restoration that covers the biting surfaces and sides of a tooth, binding it together for strength. A crown is all finesse, an exacting creation. A well-fitting crown is precisely tailored to match adjacent teeth. It must mesh well with opposing teeth so your bite works efficiently. Bridges are an exercise in creativity and engineering. Bridgework recaptures a stable oral environment, preserving the strength and integrity of the dental arch. A bridge can span a single missing tooth, or many. Conventional bridges usually involve crowns at either end. A false tooth, or “pontic,” fused to the crowns, fits in between. In new designs, the bridge can sometimes be bonded to neighboring teeth without crowns. Crown and bridge treatment brings a lot of satisfaction to both patient and dentist. Integrity is the watchword: properly conserved and restored, your teeth will reward you with great dividends in comfort, pleasure and good health. It’s enough to make you smile.